Hurricane Katrina was the most destructive hurricane to hit the United States. This category 5 hurricane was also the most expensive natural disaster ever to affect the United States. It caused around $108 billion worth of property damage. It formed on August 23rd 2005 and lasted until August 31, 2005. It originated as a tropical storm over the Bahamas. Katrina had a maximum wind speed of 175 mph. It was the third deadliest hurricane in the US history after Galveston in 1900 and Okeechobee in 1928. The States most affected by hurricane Katrina where Florida, Louisiana, Alabama and Mississippi. At least 1800 people died due to Hurricane Katrina and most of them were senior citizens. 705 people are reported as still missing as a result of Katrina. During this time, 80% of the city of New Orleans flooded to varying depths up to about 20 feet. It ranks sixth overall in strength of recorded Atlantic hurricanes. 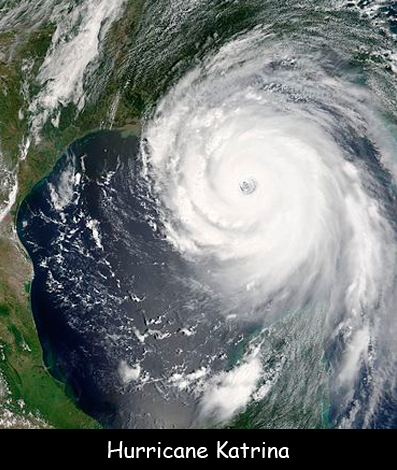 Katrina weakened to a Category 1 hurricane after moving inland over southern and central Mississippi. During this hurricane, the National Guard was called in to help with evacuations. According to NOAA, it was one of the largest displacements of a population since the Great Depression. The New Orleans metro area’s population had dropped dramatically, from 1.386 million in 2005 to 1.04 million in 2006. Katrina and the severe floods caused by this also broke through New Orleans’ Levee System. Declan, Tobin. " Facts for Kids about Hurricane Katrina ." Easy Science for Kids, Apr 2019. Web. 21 Apr 2019. < https://easyscienceforkids.com/hurricane-katrina/ >.